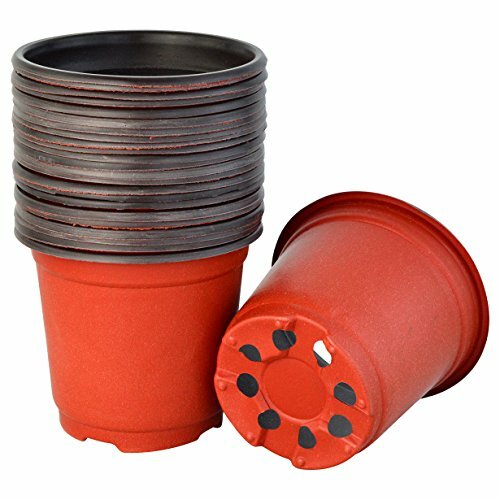 Yookat 100 Pcs 4 Inch Plastic Plants Nursery Pot/Pots Seedlings Flower Plant Container Seed Starting Pots Planter Transition Pot Round Lightweight Washable Gardening Supplies by Yookat at Tulips Orchids. MPN: Plants Nursery Pots. Hurry! Limited time offer. Offer valid only while supplies last. SOFT THIN DURABLE PLASTIC POTS: The nursery with pots are made of new pp material, non-toxic and odourless, soft texture and thin plastic.Lightweight durable pots,not easy to break under crush, extrusion deformation will not affect the use,does not fade and anti-freeze, perfect for gardening beginners simple planting and professional large quantities of planting use. VENTILATION HOLES DESIGN:There are eight holes at the bottom, which makes your plants or seeds breathe and ensure drainage, the roots of plants or seeds will not rot. Suggestion: you can put a small single sheet of the newspaper in the bottom of the pot to allow it to drain and also keep the soil intact. PORTABLE SIZE: These plastic nursery pots size 3.5x4 inch(L*H), small pots, perfect size to start seeds in,suitable for small size planting.Portable for carrying, convenient to use. Suit for up-pot seedlings until large enough to go in the garden,makes your transplant easier without disturbing the root. WONDERFUL PLANTS NUESERY POTS: These plastic posts are greatly suit for cultivating succulent plants,landscape plants,vegetable,flower, sapling, potted plant etc. Great for transplant tomatoes, cucumbers or beans for the garden. Package include 100pcs pots, suit for large area cultivation, professional nursery or personal gardening use. Put a little plant at your computer desk, bring a bright green sense to you, nice decoration for office and study room. PRACTICAL ITEMS AND GREAT SERVICE: You will get 100pcs functional nursery pots at cheap price, provide your plants a nice room. You can put them in your house, garden,office or everywhere you like. It will be a great sense of accomplishment to see the seeds buds and grow under your care. If you have any problem with the problem, please feel free to contact us for replacement or refund. If you have any questions about this product by Yookat, contact us by completing and submitting the form below. If you are looking for a specif part number, please include it with your message.